Looking for a New Volkswagen Atlas in your area? 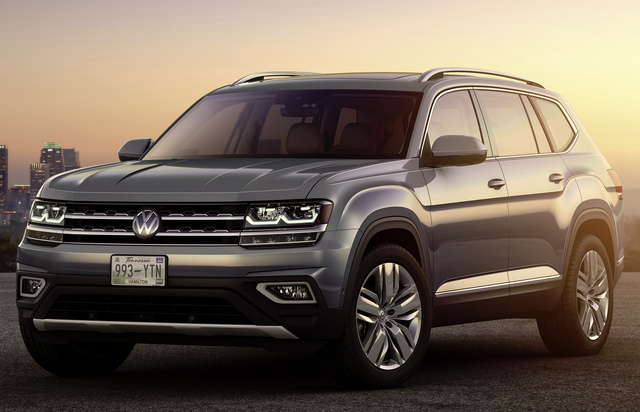 CarGurus has 671 nationwide Volkswagen Atlas dealers with 18,507 new car listings. 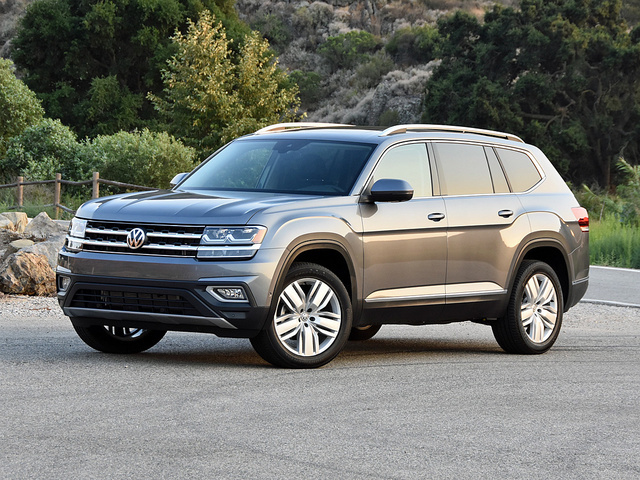 Big, boxy, and beautiful in a strictly practical sense, Volkswagen builds the ultimate family-size crossover SUV in the 2018 Atlas. After years of ignoring American vehicle preferences, and then misreading market changes, and then suffering the humility of “Dieselgate,” Volkswagen fittingly rises from defeat in the muscular arms of the 2018 Atlas. Whether the automaker named its new 3-row crossover SUV after the Greek mythological figure or old-timey, oversize books full of paper maps is irrelevant. The 2018 Volkswagen Atlas holds the key to the company’s future and inspires long summer road trips to parts unknown. 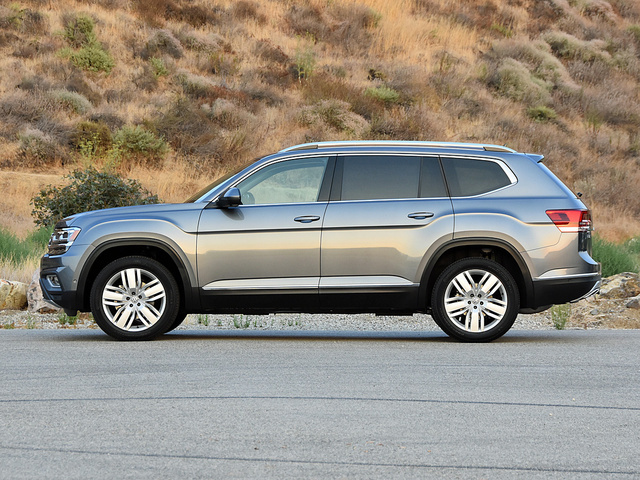 The 2018 Volkswagen Atlas is my new favorite family-size SUV. Featuring legitimate room for seven adult passengers, offering more cargo space than a Chevrolet Tahoe, equipped with nearly all the bells and whistles American families want, and wrapped in bold styling, the Atlas represents an impressive new benchmark among 3-row crossover SUVs. Furthermore, the Atlas represents value, and not just because Volkswagen seeks to give buyers confidence through a new, fully transferrable, 6-year/72,000-mile bumper-to-bumper warranty. Pricing starts at $31,425 for the S trim level with a turbocharged 4-cylinder engine and front-wheel drive (FWD), and runs as high as $49,415 for the SEL Premium trim level with a V6 engine and 4Motion all-wheel drive (AWD). My test vehicle was the SEL Premium trim, painted Platinum Gray. Exclusive features for the SEL Premium include standard 20-inch aluminum wheels, real leather upholstery, Volkswagen Digital Cockpit instrumentation, a Discover Media infotainment system with embedded navigation, a 12-speaker Fender premium audio system, self-steering parking-assist technology, and a 360-degree surround-view camera with front and rear parking sensors. Additionally, the SEL Premium is the only Atlas equipped with heated and ventilated front seats, heated rear seats, ambient cabin lighting, automatic high-beam headlights, LED taillights, and folding side mirrors with puddle lights. What do these upgrades cost? Volkswagen says the SEL Premium commands a $5,800, umm, premium over the SEL model. At the same time, the SEL Premium’s price comes within $1,600 of the least expensive Audi Q7 you can buy. Before you conclude that the Atlas is a bargain Q7, you need to understand that the two vehicles are quite different from one another. The Atlas is built on a version of the modular Volkswagen Group platform that underpins the smaller VW Golf, while the Q7 shares its bones with vehicles such as the stout Bentley Bentayga. So yeah, they’re different. Honestly, I prefer the Volkswagen’s styling to the Audi's. The Atlas is better looking in person than in pictures, natural light toning down both the cheese-grater grille and creased fender haunches while enhancing the hood’s rather dramatic sculpturing. There is an upscale, squared-off, rugged sensibility to the Atlas’s styling, not unlike an old Jeep Grand Wagoneer but without the silly fake wood siding. Cohesive and fundamentally conservative, the Atlas’s rectilinear looks ought to age gracefully. Similar themes play out inside. Straight lines and Germanic sensibility rule, and though the simulated wood is obviously not real, neither is it a source of ridicule. Simple forms, upscale detailing, and conventional controls lend the cabin instant familiarity, while the sound of the doors closing and the glove box door slamming shut impart proverbial bank-vault solidity. At nearly $50,000, the Atlas SEL Premium’s interior materials need to be kicked up a notch. From the strange felt lining the cupholders and center-console bin to what feels and sounds like hollow recycled milk-jug plastic lining the cargo area, there are occasional disconnects between what is paid and what is received. After a short production delay, Volkswagen will offer a 2.0-liter turbocharged 4-cylinder engine in the Atlas. It will produce 235 horsepower at 4,500 rpm and 258 lb-ft of torque starting at 1,600 rpm, powering the front wheels through an 8-speed automatic transmission. It will be available with S, SE, SE with Technology Package, and SEL trim levels. Until then, the only engine choice is a 3.6-liter V6 engine producing 276 horsepower at 6,200 rpm and 266 lb-ft of torque at 2,750 rpm. It also sends power through an 8-speed automatic and is available with FWD or AWD. All Atlas SEL Premium variants include the V6 and AWD as standard equipment. Volkswagen’s 4Motion AWD operates in front-drive mode under certain conditions, decoupling the rear axle from the drivetrain in order to reduce friction and improve fuel economy. Up to half the power automatically flows to the rear wheels, and at each axle the system can distribute power between the wheels to maximize traction. Additionally, the transmission includes a Sport driving mode and a manual shift gate, the AWD system comes with multiple settings that tailor operation for specific surfaces and types of terrain, and the driver can choose Eco, Normal, Sport, and Individual modes that calibrate the throttle, transmission, and steering for specific types of driving. 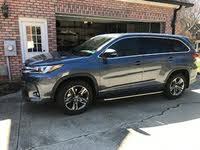 Maximum towing capacity measures 5,000 pounds, maximum ground clearance measures 8 inches, and thanks in part to automatic engine stop/start technology, the EPA says my SEL Premium should have gotten 19 mpg in combined driving. My observed result was 18.2 mpg on my test loop and 17.3 mpg after a week and 650 miles of driving. Fuel economy is the least satisfying thing about driving the Atlas SEL Premium, but given its interior size and 4,500-pound curb weight, it isn’t entirely unexpected. Drive the Atlas with vigor, and it will consume gas like a fraternity pledge does beer. 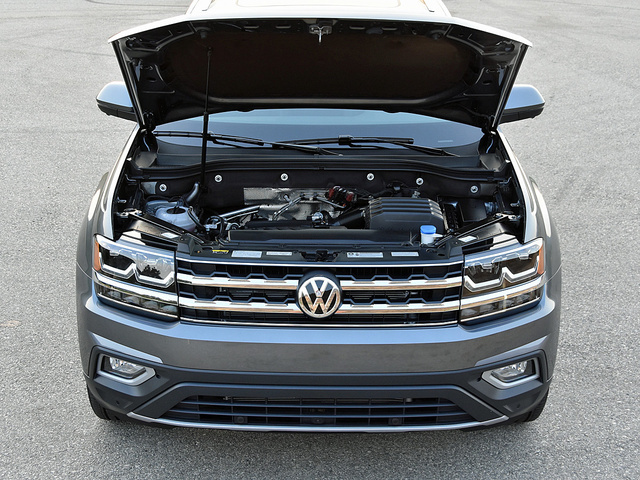 Volkswagen’s V6 works hard in the Atlas, providing just enough power to keep this father of four satisfied. The 8-speed automatic transmission capably performs its task, but there is a granular sensation associated with power delivery, one that I attribute to the engine and the 4Motion AWD system. Big brakes, effortless steering, and a tight turning radius all make the Atlas agreeable to drive. It didn’t take long for me to determine that the SUV’s lane-keeping assist system and I would not get along, as it ruined on-center feel while driving on highways and freeways. Once I shut it off, I was a happier camper. And then, after I switched the Atlas to its Sport driving mode, I had no issues with the steering aside from its freakishly small wheel. Volkswagen uses a strut front and multi-link rear suspension design for the Atlas. In combination with the 20-inch wheels and 255/50 tires, it was obvious that the company needs to better isolate impact harshness from the cabin. The racket imparts a sense of fragility diametrically opposed to the Atlas’s rugged design and solid build quality. While they’re at it, the SEL Premium could use an adaptive damping suspension. Occupants suffer too much head toss while the SUV rocks laterally on undulating road surfaces. Feeling firm and secure at speed, the Atlas thunders down freeways, nimbly threading through traffic despite its size. Around town, the Atlas tackles speed bumps, drainage dips, and driveway aprons like they’re not even there. I entertained the kids with a rousing exit from the parking lot at The Grove shopping mall in Los Angeles, bouncing the SUV down to the ground floor from the fifth-level deck (if you’ve been there, you know what I’m talking about). Off-road, the Atlas effortlessly trundled through ruts and surmounted a steep, angled trail that stymies many of its direct competitors. Outward visibility is impressive, and the SUV’s boxy design and long, flat hood make it super easy to park. The 360-degree camera that comes with the SEL Premium trim supplies downright stunning clarity, and parking sensors make it easy to squeeze the Atlas into tight spaces. Park Assist is also standard for the SEL Premium, helping to park the vehicle by autonomously steering the Atlas while the driver operates the pedals and transmission. However, since I find this technology utterly useless in exactly the kinds of situations where it is most needed (quickly cramming into small spaces on busy city streets while traffic backs up behind you), I didn’t bother with it. Where the Atlas most impressed me, though, was on Mulholland Highway in the Santa Monica Mountains near L.A. I began my descent from nearly 2,000 feet of elevation with some trepidation related to the SUV’s length, width, height, and weight. However, the closer I got to the road’s terminus at Pacific Coast Highway, the more confident I became in its handling and braking capabilities. By the end of the run, I was slinging it around with greater enthusiasm than I do most crossover SUVs. Volkswagen takes a no-nonsense approach to the Atlas’s control layout, placing the various knobs, buttons, and screens in logical locations. Markings could be larger, and the Start button is located on the center console rather than the dashboard, but otherwise there is little about which to complain. At night, everything is backlit in white, and the SEL Premium includes white ambient lighting for the dashboard and door panels. Comfort is exceptionally good, and not just for the driver. 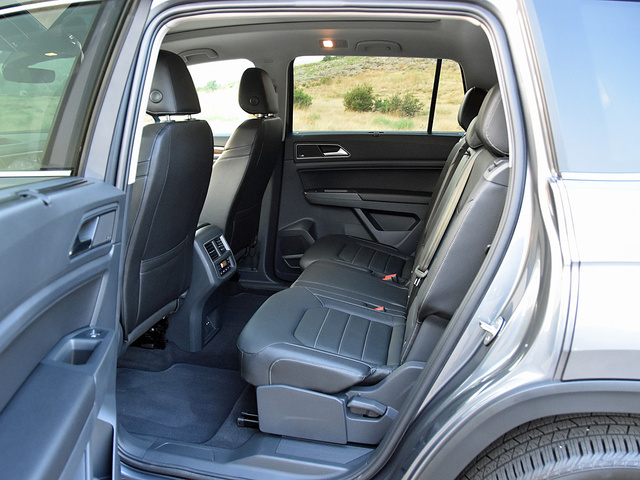 Every seating location puts the competition to shame, and this might just be the first SUV in this segment that can carry adults in the third-row seat for hours rather than minutes. Front seat comfort is excellent, thanks to the SEL Premium’s heated and ventilated cushions and a range of power adjustments to find a perfect position. I like to sit up high, which makes the armrests less useful, but I’m not going to complain too loudly. Both my wife and I also thought the Atlas’s air conditioning system took too long to cool the cabin, but black leather and a panoramic glass sunroof certainly made the system work overtime. A 3-person, 60/40-split folding second-row bench seat is mounted on tracks that allow it to slide forward and back. Later in the year, Volkswagen will offer individual captain’s chairs as an option for most versions. Even when they’re located in the middle of their range of travel, the second-row seats supply plenty of legroom and foot space, and three adults can easily sit side by side. Slide them all the way back, and the Atlas provides limousine levels of room. With the second-row seat in its middle position, the third-row seat is nearly as habitable by adults as a minivan’s. I am not embellishing here. If you’ve ever ridden in seat 22A on a 737 operated by a human-cargo cramming airline, you’ll recognize the Atlas’s sixth and seventh occupant positions as similar in size and comfort. You’re right, that might not be the best analogy, but the point is that if you can sit in 22A for a few hours of flight time without going on a murderous rampage, you can also do that in a VW Atlas’s third-row seat. And that’s an improvement over the competition. By official measurements, this Volkswagen’s rearmost row is more accommodating than that of a Chevrolet Tahoe. 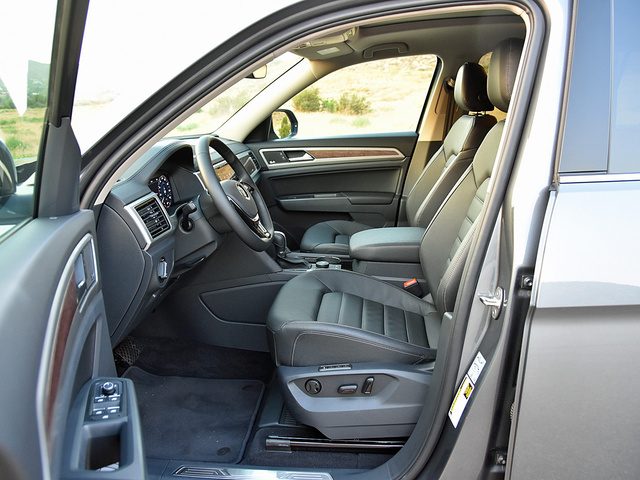 The Atlas offers more cargo space than Chevy’s full-size SUV, too. Power open the liftgate, which offers hands-free operation on some models, and you’ve got 20.6 cubic feet of space at your disposal. That’s enough for a couple of full-size suitcases and backpacks and more than you’ll require for most local errands. Volkswagen thoughtfully provides storage trays and lighting on both sides of the cargo area. Folding the third-row seat is easy, and doing so delivers 55.5 cubic feet of space. This, combined with a low floor and tall second-row seatbacks, is easily enough for a family of five to take an epic summer road trip without requiring a car-top carrier. Fold the second-row seats down, and you’ve got 96.8 cubic feet of cargo space. Did I mention that the Atlas is big inside? Volkswagen reserves its Discover Media infotainment system for the SEL Premium trim level, and it offers exclusive embedded navigation and Car-Net Guide & Inform subscription services such as real-time traffic information, local gas prices, and other data of nominal value. It is paired with an excellent, 480-watt, 12-speaker Fender audio system. Generally speaking, this is a useful infotainment system with pleasing graphics and a responsive touchscreen. Importantly, it includes Apple CarPlay, Android Auto, and Mirror Link smartphone projection technology, along with HD Radio, satellite radio, and the full slate of Car-Net apps and services. In particular, I love how Volkswagen handles radio station pre-sets, which are tiles that you can swipe through to find something worth hearing. Volkswagen also supplies handy Volume and Tuning knobs, which allow for adjustment without looking away from the road. Sounds good so far, doesn’t it? In my experience, the problem is with the navigation system. It does not offer natural voice-recognition technology, forcing you to use specific prompts to program a destination. It offers narrow ability to find points of interest without a specific address. And the first time I used it, to travel to a new destination on the other side of town, it got very confused and ultimately thought I was driving about 30 miles away from my actual location. What does this mean? If you’re in a city other than your own, and you’re craving an afternoon shot of caffeine, you can’t simply ask the system to navigate to the nearest Starbuck's. If you know of a landmark near your destination, but haven’t got an exact address for either, you can’t ask the system to navigate to, say, the Aquarium of the Pacific in Long Beach. Finally, if you’re in an unfamiliar area and the system loses its positioning data, which this Atlas did often, you’re out of luck. The good news is that your smartphone is called that for a reason. I connected my iPhone to the Atlas’s infotainment system via the USB port, and Siri had no trouble finding my favorite coffee shop, or marinas near aquariums, or other destinations. Plus, since the test vehicle’s Guide & Inform subscription was inactive, Apple Maps provided me with real-time traffic reports while suggesting alternative routes that would save me time. An automatic post-collision braking system is standard for the Atlas, an important feature designed to bring the SUV to a halt as soon as possible following a collision. By doing so, Volkswagen intends to limit the potential for secondary collisions, which would occur after the airbags have already deployed, thereby putting occupants at greater risk for injury. Beyond this, a reversing camera is standard, and in all but the base Atlas S it offers multiple viewing angles. From there, depending on the trim level, the Atlas is offered with a blind-spot monitoring system with rear cross-traffic alert, forward-collision warning with pedestrian detection, low-speed forward and reversing automatic emergency braking, and lane-departure warning with lane-keeping assist. As I mentioned earlier, I shut off the lane-departure warning and lane-keeping assist system early in the test period, because I did not like the degree of artificiality it introduced to the steering. Otherwise, apart from somewhat dim blind-spot warning lights on the side mirrors, I had no trouble with the Atlas’s driver-assistance and collision-avoidance systems. Over the course of 650 miles, they issued no false warnings. As this review is written, crash-test ratings are unavailable for the Atlas. Volkswagen faces potential challenges when it comes to the Atlas’s cost effectiveness. For example, several desirable features are restricted to the most expensive SEL Premium trim level. Disappointing observed fuel economy is another issue, and historically Volkswagens haven’t exactly topped Consumer Reports and J.D. Power dependability surveys. Most likely this is why Volkswagen is offering an extended, transferrable, bumper-to-bumper warranty on the new Atlas. Speaking of J.D. Power, the company’s data shows that reliability is one of the most important factors to impact a consumer’s decision about a new vehicle. Given the warranty and the impressive build quality, combined with the Atlas’s appealing design, undeniably practical interior, and capable driving dynamics, I’d be inclined to give this Tennessee-built SUV a chance. After all, with the 2018 Atlas, Volkswagen is attempting to lift itself up, regain the confidence of car buyers, and prove its relevance in segments that appeal the most to Americans. Based on my time with the Atlas, navigation-system glitches notwithstanding, the company is off to an excellent start. 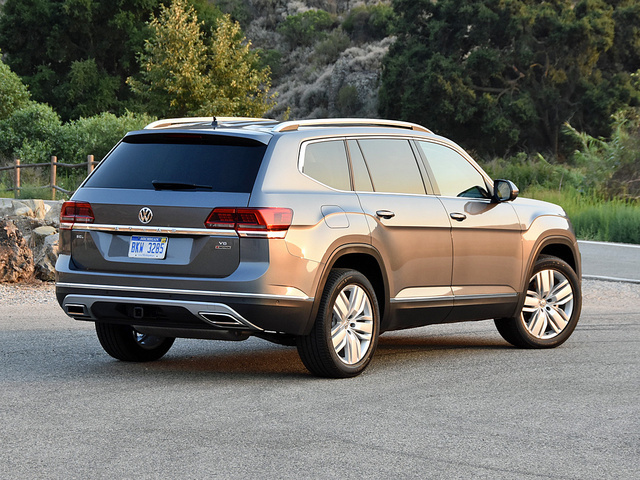 What's your take on the 2018 Volkswagen Atlas? TheHorror Did the Mitsubishi Endeavor sell so well as to need to be resurrected? HANISH22 Christian....You are BESTEST ! ! ! ! ....After watching your review, I did purchase the Atlas SEL Premium 4MOTION....Please keep up the good work of enlightening and entertaining us with your reviews in future. I will be eagerly looking forward for more reviews from you. By the way this vehicle is practical and absolute value for money with all the safety features and other goodies it offers. I never was a VW person but after your review that perception did change. Thanks to you. Have you driven a 2018 Volkswagen Atlas? Enter your zip to see incentives for a new Atlas in your area. Looking for a Used Atlas in your area? CarGurus has 19,805 nationwide Atlas listings starting at $19,900. Just bought a used 2018 Volkswagen Atlas and the financing wrote up our contract with the vin number but instead of it stating it was an Atlas, it said it was a Thing? Why and is that legit?